For the ultimate ‘wow’ factor absolutely nothing compares to the beauty of a natural hardwood floor for your trade show exhibit. Select from 12 beautiful, natural woods—all responsibly forested using environmentally sustainable practices—including Maple, Oak, Ash, Beech, Cherry and Walnut. Each package is designed to be portable and sized to fit perfectly in your exhibit space. The interlocking panels easily fit together to form a solid, smooth, beautiful, and very durable floor that can be used again and again from show to show. Custom sizing is available, please contact us if you would like a quote or have any questions. Each package is available in three common exhibit sizes. Many other sizes are available; contact us for details. 7 standard wood types; including Maple, Ash, Beech & Oak. 5 premium wood types; including Walnut, Cherry, Maple & Oak. 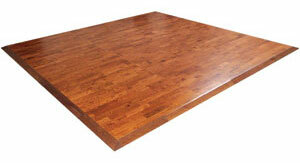 Interlocking MDF flooring that can be painted or used as a sub-floor.